With all this talk about Tesla going private, hitting record VIN registrations for the Model 3 and the Chinese Gigafactory 3 going full steam ahead, not many people are talking about worthy opponents to the Model 3. First, let’s see what they’d be up against. The Model 3 is now one of the Top 10 best-selling cars in the United States. That’s not within the EV segment and not even within the entry-level luxury segment where it’s operated until now. That’s their overall ranking in the passenger car segment in the U.S. as of July 2018. And that ranking is only going to get higher as Tesla ramps up production. As a matter of fact, there are only 10 models from different companies that sold more than 10,000 units in the month of July this year. No other EV made it to the Top 10. 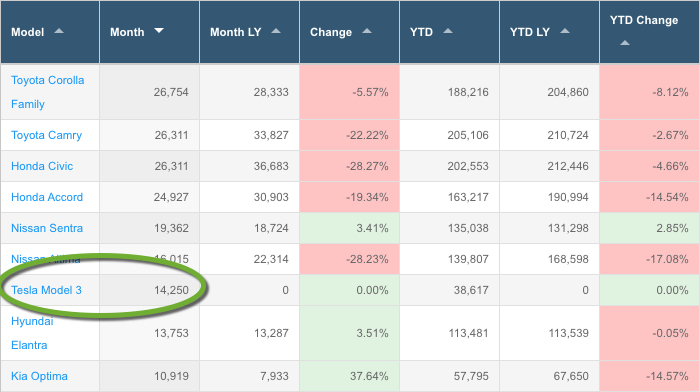 As a matter of fact, the entire Toyota Prius family, of which the Prius Prime is a part, sold a little more than half of what the Model 3 alone did in July. Considering this gap, the only way to predict the future EV stars of America is to first look at the top-selling plugins, and then look at emerging companies that have products in a comparable price range. That boils it down to the Prius Prime, Chevy’s Volt and Bolt EV, the Honda Clarity PHEV and the Nissan Leaf. But the problem is that their collective sales for July stand at 7,223 units or, once again, a little more than half of Model 3’s sales. So is there really a worthy opponent out there for the Model 3 even when the price stays north of $50,000? No, there isn’t. We can speculate all we like about which of the existing models can match Model 3 sales over the next few years, but it’s clear that there’s no other contender in the U.S. EV market. In fact, even within that space, three of the top 5 models belong to Tesla. But the thing is, the U.S. is not the heaviest market for EVs. That would be China, so it makes sense for us to zip over to the other side of the globe and see what things are like in the market that consumed 49% of the world’s plugin vehicles produced in 2017. Overall NEV (new energy vehicles, as China calls them) sales topped 600,000 units for 2017. Not accounting for seasonal variation, that’s about 50,000 cars a month. The estimate for 2018 is 50% higher, or about 75,000 cars a month. More than 90% of that is produced locally by OEMs like BAIC and Geely, among others. Tesla is the largest ‘non-Chinese brand’ in that market. In terms of volume, Tesla can’t match Chinese companies selling locally. With production at the planned Gigafactory 3 in Shanghai slated to begin in 2020, we could see Tesla putting out at least 250,000 cars per annum within two years of that timeline. The eventual capacity of the plant is 500,000 cars a year, which is more than 40,000 cars a month. In a market that’s expected to reach 75,000 cars a month or more this very year, it’s not a stretch to assume that those 40,000 cars will be absorbed by the market when 2022 rolls around. What gives that assumption a high probability is the fact that a Gigafactory in China will allow Tesla to produce more for less. China has shown enough interest in this deal for us to presume that Tesla will get adequate subsidy backing if the cars it sells in China are made locally. And if a Chinese entity like Tencent were to help Tesla go private at this crucial time of trade conflict, it would be a win-win situation for everyone but Trump’s America. So the only recourse we have is to assume that there really isn’t any other player to take on Tesla on a global scale at the moment. The majors all have years to go before they introduce their full electric fleets, and none of them will ever capture the collective consumer imagination like Tesla did. This article might be very different if we were in 2023, but for now, Tesla is the clear monarch of the battery-powered auto world, with no heir-apparent on the horizon for at least another half decade.